Pretty paper goods & calligraphy will give your event the fun, detailed touch that shows off your personality. Choose from a large assortment of paper and ink colors. Show off your wedding date, names, hashtag, and even entertaining Q&A's about the bride and groom. If you have an idea for personalized placecards for your event, reach out to us in the contact section and we'll do everything we can to make your idea come to life! Choose from a large assortment of paper and ink colors for your event menus. Reach out to us for a mockup design! We can put personalized ink on just about anything! 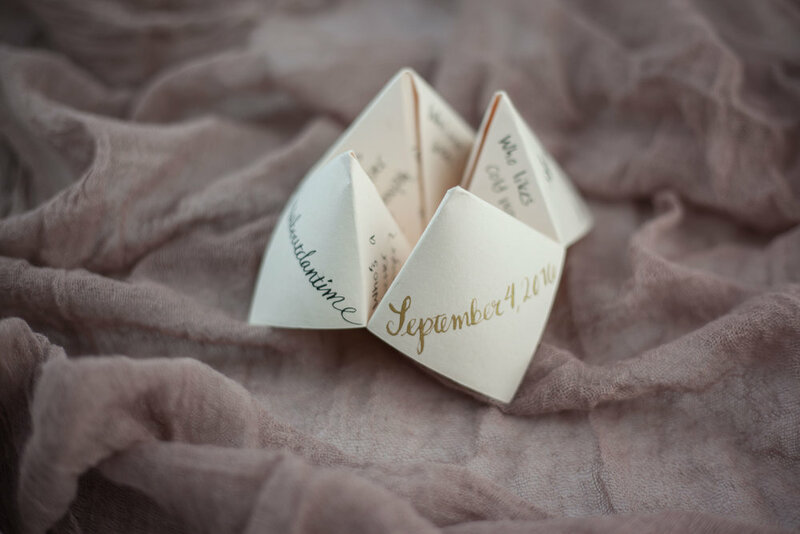 If you need calligraphy for cootie catchers, placecards, menus, invitations or anything not seen on this page, give us a shout! We can provide pricing and mockup designs for you.